THE accolades continue to flow for Ash Barty. The Queenslander has been awarded the WTA breakthrough of the Month award after a stunning surge in Wuhan. Ranked No.325 at the start of the season, Barty has climbed to a career-high mark of world No.23 after rediscovering her zest for the sport after a stint in cricket. With wins over CiCi Bellis, Agnieszka Radwanska, Karolina Pliskova, Jelena Ostapenko and Johanna Konta, Barty has re-emerged as a world-class competitor. She lost the Wuhan final in a tight three-setter to Caroline Garcia. Garcia, who was five years ago earmarked by Andy Murray as a future world No.1, won again the following week and is now in the top 10. 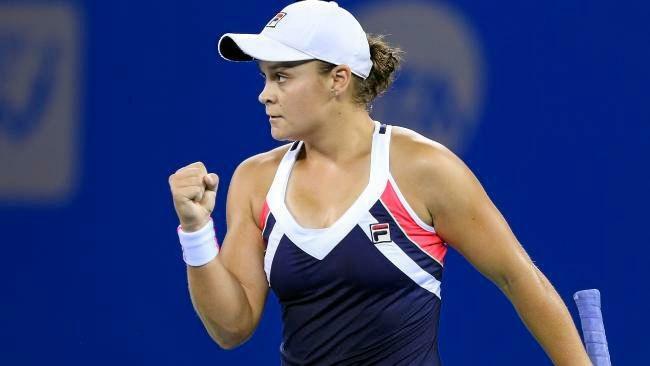 Barty was overwhelming chosen as the breakthrough player of the month by WTA fans - securing the gong with 87 per cent of the vote over Maria Sakkari (13). The sublimely talented all-courter joins an illustrious group of rivals to win the award this year, headed by French Open champion Jelena Ostapenko, CoCo Vandeweghe and Kristina Mladenovic. Barty is at the forefront of the Australian's women's resurgence in 2017. Sam Stosur, Daria Gavrilova and Barty have all won singles titles. Given her astonishing rankings climb, Barty is a strong contender to win next month's John Newcombe medal as Australia's best-performed player.